Ex Machina doesn’t look or feel quite like any other comic out there. Sure, there are a number of comics that combine the superhero genre with realpolitik, some that look at superheroes in the ‘real’ (i.e. our) world and there are some that have looked at the fallout from 9/11, but none have gone as far as Ex Machina in combining all of these elements in as grounded and intelligent a manner. 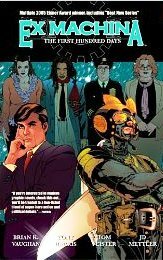 Ex Machina is the story of Mitchell Hundred, the Mayor of New York after Rudolph Giuliani, a man swept into power on the back of his former days as a super-powered vigilante, ‘The Great Machine’. His particular power is the ability to hear, communicate with, and control any and all complex electronic devices. On September 11th 2001 he used this power to prevent one of the hijacked planes from crashing into the second World Trade Centre Tower. He was too late to stop the first plane, a fact that haunts Hundred, and the entire series, from the outset. The first issue starts with a definition of ‘deus ex machina’ and an image of a costumed individual flying towards a plane. The next page reveals that this is a photograph of ‘The Great Machine’ on 9/11, an image that Mitchell Hundred describes himself as being ‘sick of’. The set-up of the series is then revealed when Hundred describes what follows as ‘ the story of my four years in office, from the beginning of 2002 through godforsaken 2005’. From here on in we skip between several distinct time frames, a device used repeatedly through the series, travelling between Hundred’s childhood in the 1970’s, the origin of his powers in 1999, his period as ‘The Great Machine’ in 2000-2001 and the start of his tenure as Mayor of New York City. Along the way we are introduced to many of the main characters in the series, including Bradbury (Hundred’s friend and bodyguard), Kremlin (the man behind The Great Machine’s costume and weaponry), Martha Hundred (Hundred’s mother), Deputy Mayor Wylie, Journal Moore (a young aide in Hundred’s office), Police Commissioner Angotti and Suzanne Padilla (his Chief of Staff) amongst others. We see the key moments in Hundred’s relationships with these characters as he, and they, are forced to deal with a number of different events, from the relatively banal (a young artist’s attempt to be edgy by creating a controversial image of Abraham Lincolm using public funds, debates over a smoking ban) to the worrying (a killer targeting city employees, an assassination attempt) to the type of thing many would consider typical comic fare (the violent origin of Mitchell Hundred’s powers and his decision to use them). In each case Vaughan is able to keep the narrative focused, revealing important information about the characters and the world they inhabit through dialogue exchanges that though wordy are never verbose nor overwhelming to the reader. The author also reveals a deep and impressive knowledge of New York political lore as well as a grasp of the minutiae of the day-to-day running of a city the size of New York. Arguments between the characters are often the highlight of a chapter as the author dissects a topic that could have been ripped directly from the paper he read the morning he sat down to write, providing different points of view (few subjects are portrayed as only one character sees them) and the differing problems presented to politicians, trying to keeps all the gears working whilst not alienating vast sections of the electorate. Using conversation as the main means of imparting this information also plays to the strengths of penciller Tony Harris, whose style of using photo reference can look awkward when dealing with a lot of action but which works brilliantly in bringing out the facial expressions of characters when conversing (or for that matter arguing, screaming or swearing at each other). Underscored by the brilliant colouring job and inks, the art style beautifully underscores the understated, realistic style of Vaughan’s writing. That’s not to say that ‘The First Hundred Days’ is the perfect introduction to the series. For the first couple of issues the author’s juggling of different timeframes can be slightly disorientating, though they do become clearer as the series progresses and each timeframe’s events influence or follow on from one another. The introduction of so many characters and events can also leave audiences feeling a little out of their depth initially, but it all adds to the richness of the series as it progresses. Ex Machina was one the most interesting series being put out over the last few years, and along with other titles such as ‘Y The Last Man; and ‘Pride of Baghdad’ has launched Brian K Vaughan firmly into the A-List of comic book writers working today. In Ex Machina Tony Harris found the perfect match for his unique looking pencils as well as to the many ideas he contributed towards the final form of the series, a collaborative match he will be hard pressed to find again. Whether you’re a political animal, a superhero fan or just someone who enjoys a tightly written story, this one is most definitely worth your time. Tony Chu is no ordinary detective. Tony Chu is a cibopath, one of only three in the world. Whatever he chews, he gains a psychic impression of; how it was grown, how it lived… and how it died. The only exception to this is beetroot. Tony Chu works as a homicide detective. And if you’ve read comics even slightly, you can see how this works out for him. 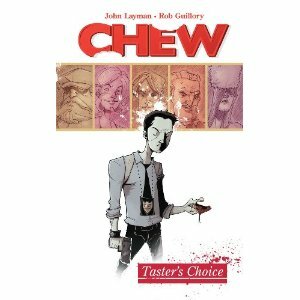 “Chew” is that rare beast, a comic with a genuinely new idea. Tony’s experiences learning to live with his powers / curse form the plot of volume one, “Taster’s Choice”*, in which he is recruited by one of the other two cibopaths, Mason Savoy, who becomes his mentor. Their powers alone would make for an interesting series, but there’s a lot more going on here. Since a massive outbreak of avian flu, poultry is an illegal substance, meaning that the police spend a lot of time tracking down dealers and users in “chicken speakeasies”. Tony’s powers are certainly useful here, but is there a cover-up going on, and will he live long enough to find out? The art is excellent. It’s a slightly cartoonish and exaggerated style – Mason is about four times the size of Tony – but that’s not a criticism; it works very well indeed for the plot, which is fascinating and doesn’t let up. Though this book should come with a warning; don’t read this if you’re very squeamish! Thankfully, the great art and skilled writing prevent it descending into Saw-type levels of horror, but there are one or two sequences that Chuck Palahniuk would have been proud to have written. Certainly it’s the only comic I’ve read containing the memorable line “I HAD TO EAT A DEAD DOG TO PROVE WHAT YOU DID!”. Strongly recommended. * The brand name for Nescafe Gold Blend in the States, if you were wondering. 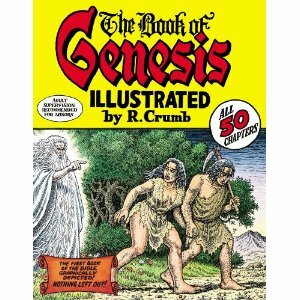 So I’m working my way through Robert Crumb’s illustrated Genesis, and it is the most fun I’ve had reading that book, even given how much I’ve enjoyed reading it in the past. Obviously there’s not much new in Crumb’s version, as he has kept the text intact, deciding to go for a straight retelling rather than the satirical take he had originally planned. With a text like that I don’t think you can help but be awed by it – if, that is, you’re not approaching it with the bias and hostility that the bible alone amongst ancient texts seems to be subject! Going over the illustrated Genesis does give one the opportunity to read the texts in a different way and to see old passages in a new light. Starting with the creation account itself, what comes across is the powerful impression that God is, among other things, a masterful story-teller, and puts into perspective the emphasis in Hebrew tradition on scripture as the Word of God. The creation account in particular, and also the Flood narrative that follows, are especially evocative and highly figurative stories, with a childlike simplicity, and they are obviously meant to speak to our imaginations and emotions. Unlike, say, Leviticus, or the Passion narratives, which are very adult texts, these stories don’t demand that the reader take them as hard fact. Instead, God presents his Word primarily as a story, accessible by children and adults alike; the same could be said for the Nativity narrative in the Gospels. The other thing I like about Genesis is the warts ‘n’ all way that its characters are presented. Noah, for example, is shown to be a bad drunk in the epilogue to the Flood story, as we see him hungover and cursing his grandson cos he’s pissed off with the boy’s father. Maybe it’s small beer compared to whatever the folk who died in the flood were up to, but he’s not exactly the genial old soul you’d imagine from the Flood narrative alone. Then there’s the story of Abraham, who winds up offending not only God but also the foreign Kings in the lands he visits by asking his wife to claim she is his sister. The basic idea is that she will help ensure the smooth running of Abraham’s business by keeping the powerful men happy. Of course, this sort of thing would be used by the New Atheists as a stick to beat the bible with, but it is pretty clear what God’s feeling on this are, and he ensures Abraham is challenged and sent packing for his deception. One of my favourite stories in Genesis, which isn’t one of the ones you hear as a kid, is that of Hagar, the handmaiden to Abraham’s wife, Sarah. Sarah is convinced that she is infertile, and so asks Abraham to impregnate Hagar so he will not be without an heir. However, once Hagar is pregnant, she begins to see herself as superior to Sarah, who jealously chases her from the camp. Hagar then has an encounter with God, who encourages her to return to her mistress and tolerate her harsh treatment for the sake of her child. A similar event takes place later in Hagar’s life, when God gives Sarah the gift of her son, Isaac. Now that Abraham has an heir by Sarah, she wants rid of Hagar’s son, seeing him as competition. Again, Hagar is cast out, and again it is God who gives her the strength to carry on, although this time they go on their way and her son becomes a reknowned hunter and fathers a nation in his own right. Again, God doesn’t condone Abraham’s fathering of a child outside of his marriage to Sarah, seeing it as a betrayal of the trust in Him that he expects them to have. But he also looks after the abandoned child and mother, which is more than Abraham and Sarah were willing to do.